An excellent alternate to flat “LTP” skylights to provide daylighting for your R-Panel roof. The RS36 offers superb lighting, does not yellow and provides uncompromising safety via an integrated, factory-installed, OSHA-compliant fall protection screen. 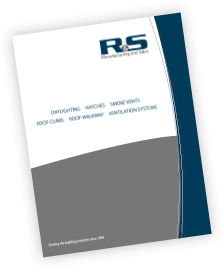 The RS36 skylight system is engineered to integrate with 12″ R-Panel/High-Rib roof. Therefore, the curb dimensions allow the unit to be installed in the same footprint as LTP models. Perfect for retrofit or new construction projects! Safety & performance at a lower installed cost versus standard skylight and safety screen alternative. Example: RS36-1WA. Single dome skylight and curb using standard white acrlic domes.